It’s been a mammoth undertaking, says Bill Bayne, CEO of Transit Wireless and a daily subway rider (“I mainly take the 4, 5, or 6,” he says). To get service to all stations, Transit Wireless had to do everything from lay 120 miles of fiber cable to design equipment that could withstand the extreme conditions of NYC subways, which (as any commuter can attest) can be freezing cold in winter and sticky, hot hell in summer. But just like when you jump on that Wi-Fi signal at Starbucks, there are things you want to do keep yourself safe. Here are three things to keep in mind while enjoying the MTA’s largesse. Quick rule of thumb: While sending traffic to https://www.somewebsite.com is relatively secure, http://www.somewebsite.com is not. “These are need-to-know things when it comes to public Wi-Fi,” says Alex Heid, chief research officer at SecurityScorecard. HTTPS (or Hypertext Transfer Protocol over Secure Socket Layer — quite the catchy name!) encrypts the data sent between users and websites. HTTP sites do not — and it’s trivial to use a “packet sniffer” to capture the unencrypted data sent between users and websites. So the danger is, if you reuse the same username and password across multiple sites (though you really should just use a password manager), entering your username and password on an unencrypted HTTP site means you’ve potentially exposed yourself to getting hacked. And for what it’s worth, it’s still possible to defeat HTTPS. Exploits like Heartbleed, POODLE, Drown — these all broke the “Secure Socket Layer” part of HTTPS. “Encryption is a math problem; people are always solving the math problems,” says Heid. There are also things like “Evil Twin” attacks, ARP spoofing, or an SSL strip, but once you’re in this territory it’s a bit like worrying about being hit by a meteor while also being struck by lightning — it could happen, but it’s unlikely, and you wouldn’t have much control over it regardless. Just keep an eye on that URL. But if you want to be 100 percent safe, Heid says there’s a much easier way to avoid all this angst: Use a VPN (virtual private network) service. If you’re super cheap and technically minded, Amazon offers a free VPN you can set up on any Android or iOS device. If you want something with fewer tech headaches, there’s a whole range of VPN services out there, most available for a few dollars a month. All VPNs will do the same thing: prevent anyone examining the Wi-Fi network you happen from seeing anything except that you’re connecting to the VPN of your choice — and nothing else. None of the data you pass back and forth will be visible except as gibberish. You no longer need to worry about whether you’re on a HTTP or HTTPS site because everything you send and receive is protected. VPNs won’t protect you against every threat. You can still get phished or hit by other social-engineering attacks (though these types of attack work regardless of the type of Wi-Fi network you’re on). But using a VPN will already put you far ahead of the pack when it comes to being secure while using an open Wi-Fi network. Much like running from a bear, you don’t need to be the fastest — you just need to be harder to catch than someone else. But let’s say you’re stuck at Atlantic Terminal and you really need to log in to a site that doesn’t use HTTPS and you’re not on a VPN. Then your best bet is to avoid Wi-Fi altogether. “It’s always better to just make use of your data plan,” says Heid. “You’re only trusting your data carrier to your data, instead of to a bunch of random ad hoc third-party data carriers.” Depending on the size of your bill, you may not have the warmest feelings toward your cell-phone company, but one thing they are pretty good at is encrypting the data you send over their networks. Absent a major data breach of your cell-phone carrier’s servers, your information will be safe. 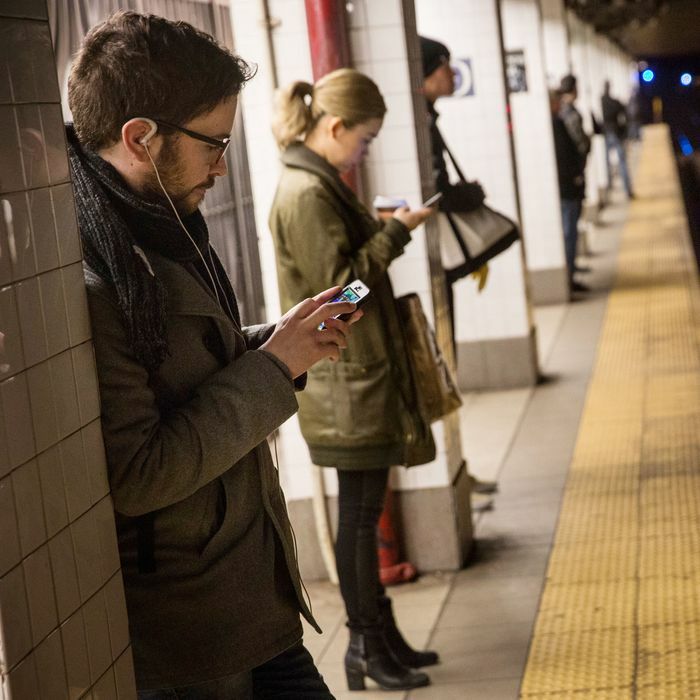 It’s great that the MTA has put in Wi-Fi at so many stations (and, for what it’s worth, Transit Wireless’s Bayne says they’re working on extending that connectivity into the tunnels themselves as well), and most of the time, you should feel fine using them. “With free Wi-Fi browsing, if you’re on a network and you see HTTPS and everything looks as it should — chances are it’s fine,” says Heid. But it doesn’t hurt take these extra precautions while using the MTA’s Wi-Fi network — even if the dangers you face while using that network are different than what you’d face at Starbucks. “The coffee-shop-style attacks don’t fly on the subway,” says Heid. “Users aren’t there for long periods of time. You have to be moving along with the target to really get it to work.” But Heid does admit the MTA’s Wi-Fi system presents its own unique temptation to hackers — while they may not be able to stay with a target for a long time, simply by sitting still at a busy station like Times Square or Grand Central they’ll have access to thousands of people, heads down, checking their phones while waiting for a train. A hacker’s chances for success may be lower than at a coffee shop — but they’ll have a lot more chances.